"Following the gentle curves of centuries old waterways, you glide past villages and countryside that will take your breath away"
This unique style of holiday takes you and a small group of fellow travellers along the inland waterways of Europe – like the Canal du Midi or Burgundy Canal in France, the Venice lagoon, the River Thames in England, Loch Ness in Scotland. You can explore wonderful countryside, delightful villages and historical treasures whilst enjoying superb service and exceptional cuisine from the onboard English speaking captain and crew. Our hotel barge cruises let you travel in all-inclusive luxury with a balanced blend of daily excursions and relaxed cruising, gourmet meals aboard and ashore, an all-day open bar, complimentary fine wines, the use of bicycles, and a lounge area on deck from which to admire the slowly unwinding scenery. The luxury hotel barges are specially converted from vessels originally designed to carry cargo on the shallow inland waterways. They offer air conditioned en-suite cabins for between 4 and 20 passengers. Cruise rates are available per person, and reflect level of luxury, season, and size of barge. The whole vessel can also be chartered by groups or companies. 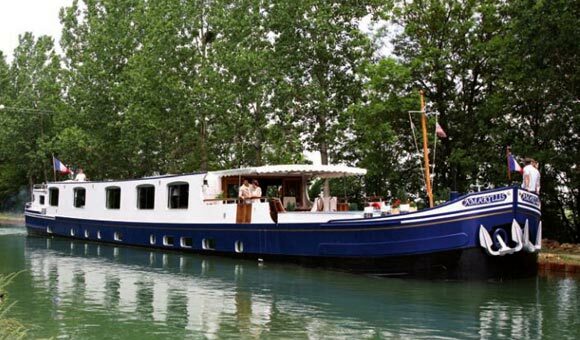 A hotel barge cruise combines the features of a luxury hotel with the pleasures of a gentle cruise amid the sights of Europe’s leading waterways. Go direct to the Hotel Barge cruises! Save up to 20% per cabin!